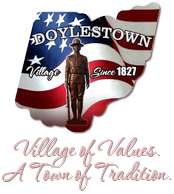 The Village of Doylestown is now accepting credit card payments either online or by telephone through our third party provider, Official Payments®. A convenience fee will apply to all payments if you choose to utilize this option. For credit card payments the convenience fee will be $2.95 and for debit card payments the convenience fee is $1.00. Visa, MasterCard and Discover are accepted. To pay online, please click on the above links; or to pay over the telephone call 1-800-272-9829 and use our Jurisdiction Code 8432. If you are facing a water shut off and have paid your bill online or by telephone, please call our Water Department and provide your confirmation number as these payments may take up to 24 hours to post to our account. 330-658-2181 ext. 1140.